I recently attended a workshop based on seasonal diets. Even though eating organic, seasonal food is quite a trend these days, its roots lie in ancient wisdom from across the world. 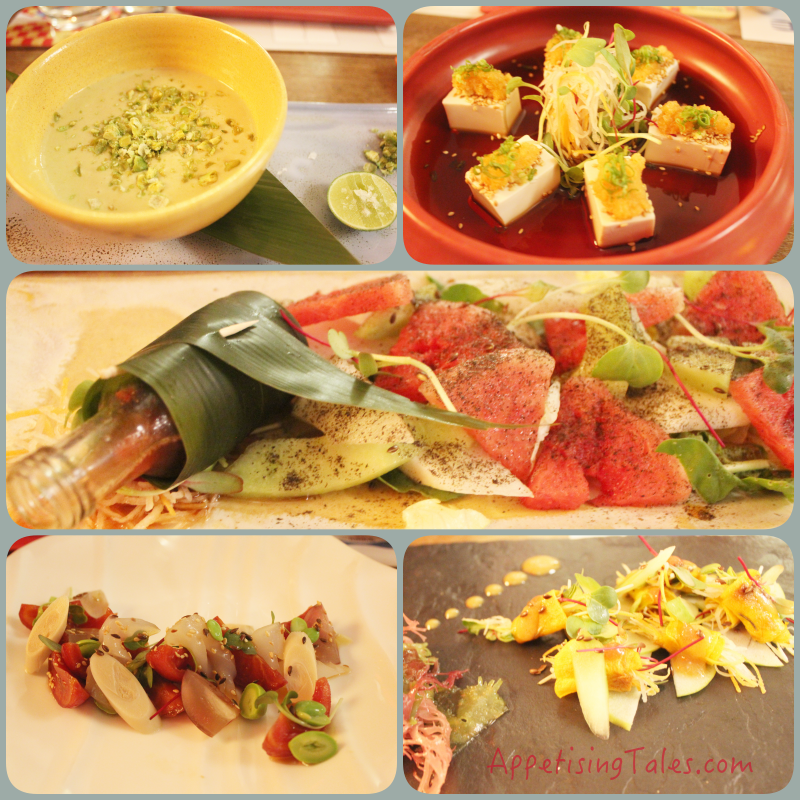 This particular workshop drew a lot of similarities between the principles of Ayurveda and Japanese cuisine. Not only the ingredients, but also the cooking techniques are used according to the seasons. For example, it’s no surprise that slow-cooked broths are ideal for winter, while dishes that require minimal cooking time (read, salads) are more suited for summer. This is not for the mere convenience of the chef, but longer cooking procedures impart heat energy to the food, that in turn gets transferred to the stomach. Even if one is not interested in understanding how food impacts our health, everyone would agree that the sweltering Delhi summer calls for cool, cool food and drinks. Ideal dishes for this season are not only the ones that are cool on the palate, but those that cool the stomach as well. 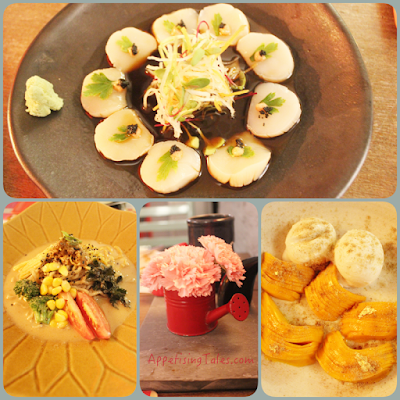 The Hanami menu at Guppy by ai is thus ideal if you want to eat out. Chef Vikram Khatri’s menu comprises not just vegetarian, but vegan dishes as well, where the focus is on delicious dishes high on nutritional value as it involves minimum cooking time. Salads, sushi, sashimi and cold noodles make the menu sound appealing even before you get to taste it! Top L-R: Corn and Avocado Soup; Hiyayakko Chilled Tofu. Bottom L-R: Tomato Edamame Ceviche; Smoked Pumpkin Salad. We start our evening with the Corn and Avocado Soup that is enriched with soy milk, served chilled with a hint of wasabi. This is an underwhelming start to our meal because no particular flavour really stands out in this soup. But the salads that follow more than make up for the soup. The 3 Melon Salad features yubari (sarda in hindi), musk and watermelon drizzled with a slightly tangy plum dressing and purple shiso dust. Each mouthful is refreshing with the juiciness of the fruits heightened beautifully with the dressing. The Smoked Pumpkin Salad is served with seaweed, palm hearts, crumbled tofu and miso-mustard dressing. And I have had a version of the Tomato, Edamame, Ginkgo Nut and Konjac Jelly Ceviche earlier; I loved it then and I love it now. The tomatoes are cured for three days, lending them a sharp tartness that is balanced with the flavours and textures of the rest of the ingredients. Hiyayakko Chilled Tofu are chilled cubes of silken tofu topped with a citrus soy, momijoroshi radish, ginger and sesame seeds. I like the simplicity of this salad, but the ginger and radish is too strong for my liking. If it is for you too, simply remove some of it from the top, and enjoy the tofu with the citrus soy sesame dressing. 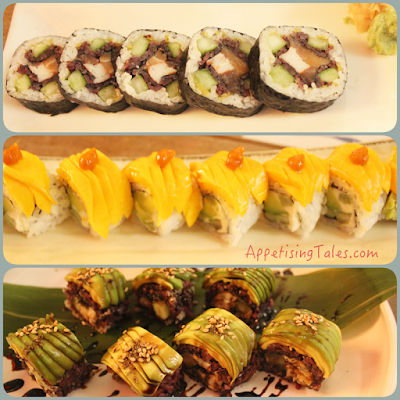 Bottom: Eel and Avocado Sushi Roll. Then of course, there’s a choice of sushi. The one that really stands out is the Mango and Avocado Cream Cheese Roll. Slivers of alphonso mango are used for this one, and mango and avocado is anyway a match made in heaven. It works quite well in sushi too. I avoid dunking it in soy though. There’s a similar version with tuna too, but I prefer the former one. The Hanami Roll is a creative thick sushi roll with tuna, salmon, crab, yellowtail and cucumber. The highlight is the sakura dembu (sakura being cherry blossoms, and dembu or denbu being sweet, pink, fluffy fish flakes). This pretty-looking roll takes almost 25 minutes to make. Unfortunately, the cucumber overpowers the lovely seafood. Topped with creamy avaocado slivers, and drizzled with a rich unagi tare sauce, the Eel and Avacado Roll is good. The sashimi of Scallop Carpaccio, with mentaiko cod roe, is served with wasabi soy. This would be a winner if only the scallop is sliced thinner. Then there’s a choice of cold noodles. While salads and sushi are expected to be cold, this section makes it ideal for hot summers. I must warn you, though, that cold noodles may require an acquired taste. We have the Cold Hiyashi Tantanmen that is home-made Ramen noodles, served chilled with sesame flavoured pork broth, spicy ground pork meat and fresh seasonal veggies. It has nice subtle flavours, the pork is succulent and the best part is that they are cold. The other options include Chilled green tea flavoured buckwjeat noodles and thin angel hair noodles. The icing on this menu is the dessert. Mango, Liquorice with Coconut Icecream includes a liberal serving of sweet alphonso mango dusted with sansho pepper powder. A wonderful end to a cool, summery meal. And options of cocktails like Sendai (vodka, fresh kiwi, fresh melon and lime), Plum Blossom (sochu, umeshu fresh plum and lime) and Umetini (sake, umeshu and gold leaf) are as refreshing as the food on offer. The festival includes masterclasses as well. There is a Sushi Master Class on 28th May where you can learn to master the different techniques and delicate flavour pairings essential in creating authentic sushi with the chefs at Guppy. Guppy by ai, 28, Lodi Colony, Main Market, New Delhi - 110003. Timings Lunch 12 - 3.30pm; Dinner 7pm - 1am. Prices Cocktails Rs 350 onwards; Salads Rs 350 each; Sushi Rs 650 onwards; Cold Noodles Rs 700 each; Dessert Rs 400.